LEFT TO RIGHT: YKASEC staff members answer calls on the voter hotline during the Feb. 5 election .• KRCC staff and volunteers register new voters at University of Illinois, Chicago .• Precinct leaders of KRC's Power Vote group meet to discuss voter registration. Super Tuesday saw a record 24 state primaries or caucuses including states with high Asian American populations. 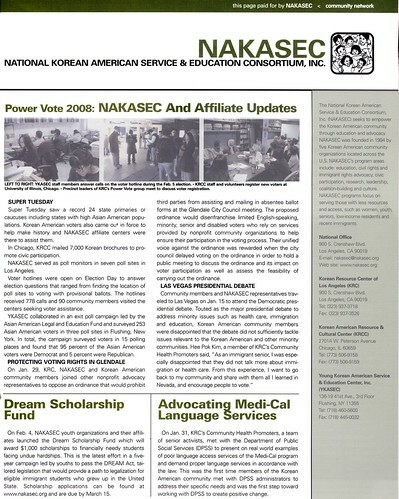 Korean American voters also came out in force to help make history and NAKASEC affiliate centers were there to assist them. In Chicago, KRCC mailed 7,000 Korean brochures to promote civic participation. NAKASEC served as poll monitors in seven poll sites in Los Angeles. Voter hotlines were open on Election Day to answer election questions that ranged from finding the location of poll sites to voting with provisional ballots. The hotlines received 778 calls and 90 community members visited the centers seeking voter assistance. YKASEC collaborated in an exit poll campaign led by the Asian American Legal and Education Fund and surveyed 253 Asian American voters in three poll sites In Flushing, New York. In total, the campaign surveyed voters in 15 polling places and found that 95 percent of the Asian American voters were Democrat and 5 percent were Republican. On Jan. 29, KRC, NAKASEC and Korean American community members joined other nonprofit advocacy representatives to oppose an ordinance that would prohibit third parties from assisting and mailing in absentee ballot forms at the Glendale City Council meeting. The proposed ordinance would disenfranchise limited English-speaking, minority, senior and disabled voters who rely on services provided by nonprofit community organizations to help ensure their participation in the voting process. Their unified voice against the ordinance was rewarded when the city council delayed voting on the ordinance in order to hold a public meeting to discuss the ordinance and its impact on voter participation as well as assess the feasibility of carrying out the ordinance. On Feb. 4, NAKASEC youth organizations and their affiliates launched the Dream Scholarship Fund which will award $1,000 scholarships to financially needy students facing undue hardships. This is the latest effort in a five-year campaign led by youths to pass the DREAM Act, tailored legislation that would provide a path to legalization for eligible Immigrant students who grew up in the United State. Scholarship applications can be found at www.nakasec.org and are due by April 15. Community members and NAKASEC representatives traveled to Las Vegas on Jan. 15 to attend the Democratic presidential debate. Touted as the major presidential debate to address minority Issues such as health care, Immigration and education, Korean American community members were disappointed that the debate did not sufficiently tackle issues relevant to the Korean American and other minority communities. Hee Pok Kim, a member of KRC's Community Health Promoters said, "As an immigrant senior, I was especially disappointed that they did not talk more about immigration or health care. From this experience, I want to go back to my community and share with them all I learned in Nevada, and encourage people to vote." On Jan. 31, KRC's Community Health Promoters, a team of senior activists, met with the Department of Public Social Services (DPSS) to present on real world examples of poor language access services of the Medi-Cal program and demand proper language services in accordance with the law. Thrs was the first time members of the Korean American community met with DPSS administrators to address their specific needs and was the first step toward working with DPSS to create positive change. Korean Americans Energized on June 3rd!